The Old Library turns one ! The Old Library is One! The Old Library, Eastville, has celebrated it’s first year since opening on the 9th September, with a fantastic day party that was thoroughly enjoyed by local residents, families and those from further afield, helping to raise £800 for the resident run community hub. Running from 12 – 6pm, the Old Library team had organised a fantastic schedule of live music from local musicians, including True Strays and the Lund Quartet, a BBQ and bar with real ales, indoor and outdoor activities, games and crafts, and welcomed over 300 people to come and celebrate 12 months of being open to the public since the building was taken over by the South Lockleaze and Purdown Neighbourhood Group C.I.C. in 2016. 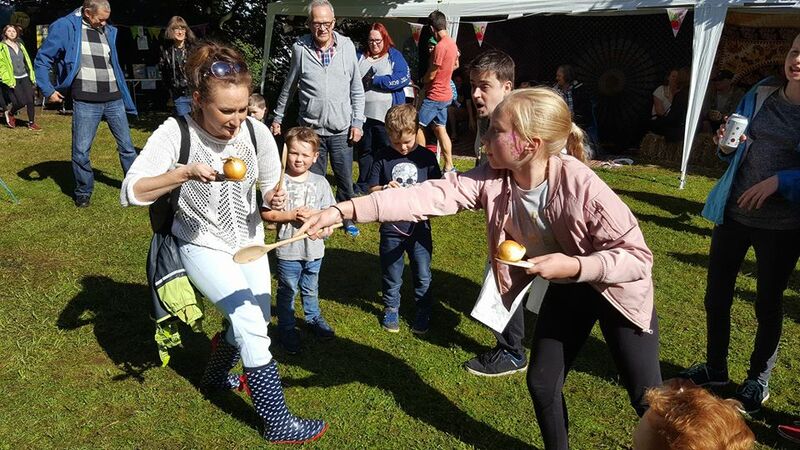 Despite the few heavy downpours earlier in the day, the Old Library event team had been well prepared for whatever the skies brought along, and hundreds turned up from far and wide to celebrate, with the annual Onion Jousting competition and Throw-a-lightbulb game being real favourites once again. There was a delicious selection of homemade cakes and donated dishes to go alongside the local butchers BBQ and homemade Samosa’s, and cooking your own bread over the campfire was a firm favourite for kids and adults alike. Throughout the day, there were workshops and taster sessions to show some of the activities that residents can take place in at the Old Library, including Circle Dancing, run every last Tuesday of the month to help raise funds for the space, and the building of a bug hotel in the garden alongside Zoe, who runs a community garden club on the 1st Saturday of the month. he events team - Emily, Tamsin, Ben and Hazel – have worked tirelessly over the past few months planning, organising and arranging activities, volunteers, licensing, donations, equipment and much more to ensure everyone in the neighbourhood had a day to remember. We would like to send a huge thanks to everyone who made it possible, including all the volunteers on the day, the musicians, all of those individuals and local businesses who donated prizes for the raffle and Throw-a-Lightbulb, everyone who baked and donated side dishes and cakes for the café and BBQ, Upcycled Mushrooms, St.Werburghs Community Centre and everyone else who came along to make the day a huge success. The money raised on the day is funding a new storage unit for the Old Library. The party marked not just 1 year of being open, but the start of the new Old Library Autumn season, which sees a whole host of new activities and events starting up and the re-opening of the weekly café on Monday’s, Wednesday’s and Friday’s from 10-4pm. If you would like to volunteer your time at the Old Library, whether helping organise events like this, or in the café, the garden, with admin, or running activities for the community, please get in touch at southlockleaze@gmail.com or contact us on Facebook. Visit www.theoldlibrary.org.uk for more information. Dated 21/09/2017. By Emily Shimell, Chair, South Lockleaze & Purdown Neighbourhood Group. C.I.C. & The Old Library.